Classic Accessories QuadGear Black UTV Roll Cage Top is manufactured to protect against sun and bad weather. It is constructed from heavy-duty UV resistant ProtekX fabric that is corrosion and abrasion resistant. This roll cage top attaches to the roll bar with four cinch-tight straps, rip-and-grip strips and two tension panel straps. It is backed by one year warranty. 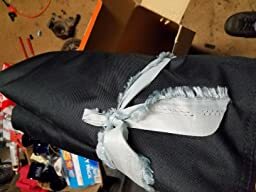 Should have looked at reviews, thing flaps all over the place and doesnt sit tight, it is cloth so water travels right through it, the thing ripped just from the wind. The seller sent a used product, box was opened with a piece of fabric wrapped around the product. Back window has a yellow streak across where you can tell tape had been sitting. Not a good seller. Product may be decent for the price if you want a sunblock. I purchased this item and have since returned it. The vinyl windshield is blurry at best and I beleive is a safety issue as it is like driving with a dirty/blurry windshield. I found my reaction times slowed greatly. I also think there should be something to secure the windshield to the hood as there is only a strap that goes side to side that does not prevent the windshield from flapping in the wind. This was even at low speeds. I’d recommend purchasing a solid windshield. On a side note, the roof seemed fine.